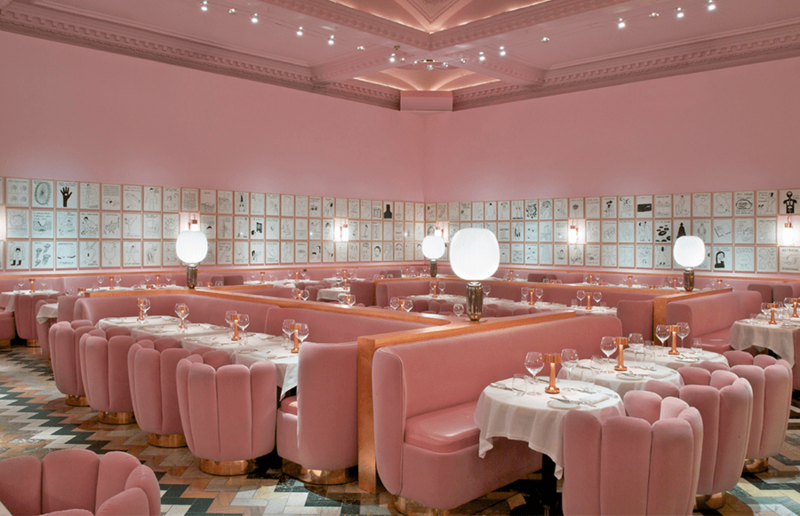 Sketch is a 18th-century townhouse tea room that transforms into a cocktail lounge every evening. It sounds as kooky as it is. With each room feeling like you’re walking into a perfectly curated art gallery. From the pink plush dining room, to the thorny green nature room. Sketch is an experience worth encountering. Stumbling across it after having dinner, from the outside it fits perfectly into Mayfair, with the whitewash smart exterior. However once inside you feel like you’re inside some kind of acid trip with each room totally unique in style, taste and personality. Just away from the hustle and bustle of Oxford and Regent Streets it’s tucked neatly away. Sketch opened almost ten years ago, and grabbed headlines then for their crazy decor. When we first entered, we decided to explore, taking each room in one by one… Quickly discovering one of my personal favourite areas of the whole venue. The bathrooms. 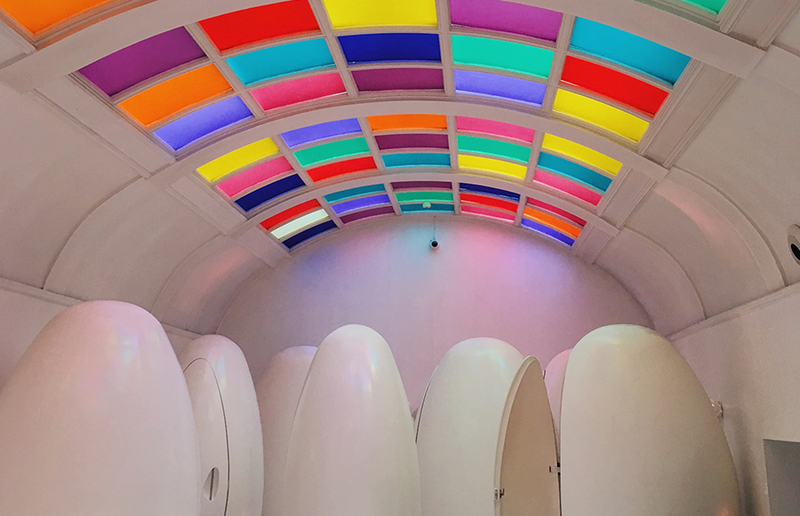 Greeted with a sweeping double staircase, and a french-maid, in full costume (of course) the egg-shaped pods are possibly the oddest toilet experience you’ll have. With light music played in, and mood lighting, it’s a relaxing shut-out-the-world type experience, and worth popping in just to try! Once you’ve used the facilities it’s worth popping into the bar directly below the bathrooms called The East Bar, which looks out onto them. The bar is 360 degrees and lined with colouring pencils, adding another quirky feature to the room. Black and white wallpaper is lined with pops of colour and a DJ booth, for those extra special weekend events Sketch is so famous for. 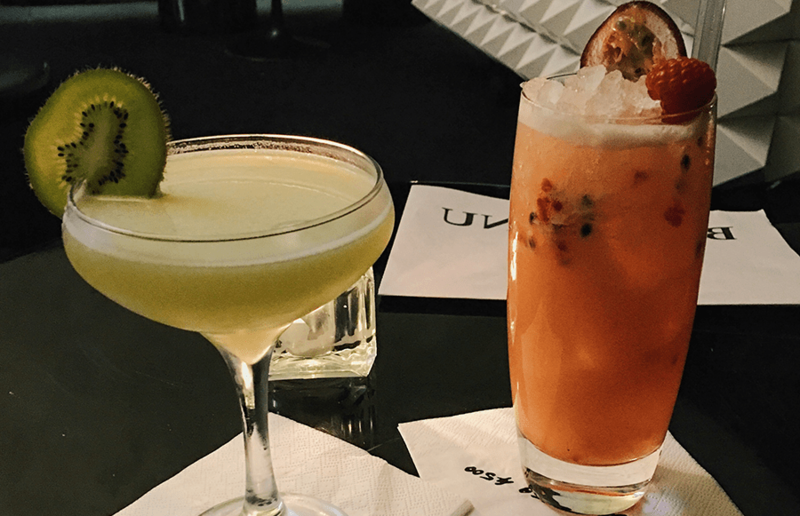 Cocktails are priced at around £15.00 each, and taste as good as they look. With the best spirits in use and fresh ingredients it’s a tasty treat, even if it is a bit on the pricey side. We went for ‘Lets Talk About Passion’ which was made with Marquis vodka, passion fruit, raspberries, pineapple and lime, as well as trying a ginger and kiwi based cocktail which we had to get more than one of! Whilst we popped in for the evening, Sketch’s afternoon tea does look like a delight. At £45 per person it’s on par with similar afternoon tea experiences, however being inside Sketch itself regardless of food is a treat. With caviar and quail egg sandwiches, pastries, macaroons and an assortment of cakes specially baked it’s a real treat. They also offer an afternoon tea with Champagne for £57 per person, or a kids version when each member gets a cute teddy bear. Whilst Sketch feels exclusive, you can walk into Parlour without a booking and it’s open early until late (although it’s members only after 9pm). Go and discover Sketch yourself, with most rooms open until 2am (Mon-Sat) and Live DJs from 10.30pm (Wed-Sat). Sketch is based at 9 Conduit St, London W1S 2XG. Visit their website to book afternoon tea here.